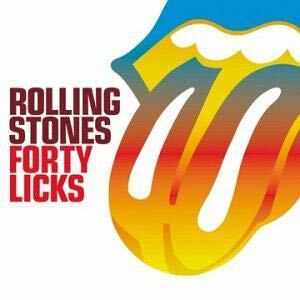 The sticker on this 2 CD Collection of forty Rolling Stones tracks proclaims 'For the First Time Ever! The Definitive Rolling Stones Collection' meaning that, at long last an overview of the Stones 40 years career can be attempted because an agreement has been reached between Universal Music Operations who own the rights to ABKCO Music Records, who in turn own the rights to Rolling Stones tracks recorded for the Decca label between 1963 and 1969, and Virgin Music who are the current distributors for the material the Stones have released on their own label since 1971 to the present day, adorned with the 'lips and tongue' that are featured on the cover of this collection. The two period are split evenly between the two CD's presumably to make it easier to split the proceeds. Now no two Rolling Stones fans are going to come up with exactly the same list of 40 tracks, or make that 36 for there are 4 tracks specially recorded for the project. Presumably the band have chosen the tracks themselves, but to my mind there are a few serious oversights in the track selection. On the first CD, the earliest track is "Not Fade Away" (1964), which incidentally is track no.9 because the tracks are not sequenced chronologically. "Not Fade Away" was their third single, their versions of Chuck Berry's "Come On" and the Beatles "I Wanna Be Your Man" the Stones first and second singles respectively being omitted. And perhaps the biggest crime is the non-appearance of "Little Red Rooster. As somebody said recently "If for nothing else, Jagger should be Knighted for getting 'Little Red Rooster', a chicago blues number done originally by Howlin' Wolf to No.1 in the UK Charts". Another omission is "We Love", the Stones on the eve of their first drugs bust fearing they would be serving time telling everybody that "We love you, and we don't care if you hound we and build four walls around we". That is from the Stones psychedelic period which is represented successfully on this compilation by "Ruby Tuesday", "19th Nervous Breakdown", "Paint It Black" and the very strange "Have You Seen Your Mother Baby?" Unfortunately from that period you also get "She's A Rainbow" from the dire Satanic Majesties album, but that's the only poor track on disc 1 from inspired cover versions "Not Fade Away", "It's All Over Now" to their own self composed singles such as "Satisfaction", "Get Off My Cloud", "Jumpin Jack Flash", "Let's Spend The Night Together" and "Honky Tonk Women". Also thrown in are classic album tracks such as "Street Fighting Man", "Gimme Shelter", "You Can't Always Get What You Want", "Sympathy For The Devil", "Mothers Little Helper" and "Wild Horses", one of the Stones country songs, which often get credited with influencing the 'alternative country movement'. So disc 1 covers the years 1964 to 1971. Disc 2 covers 1972 tot he present as there are four songs recorded just a few months ago. The best by far is the Keith Richard's sung "Losing My Touch", one of his country ballads, The other three fall into that 'not bad category' which have filled their albums for the last twenty years or so. Not that this second disc is not without some nuggets such as "Tumbling Dice" and the Keith sung "Happy" from "Exile on Main St", "Miss You" and "Beast Of Burden" from "Some Girls" released in 1978 which is always described as the Stones riposte to punk & disco, although why "Miss You" is often cited as being disco is a mystery. You also get the ballads "Angie" and "Fool To Cry", but unfortunately no "Waiting On A Friend". "Brown Sugar", the single that launched the 'Lips and Tongue' Rolling Stones Records in 1971 is certainly one of their very best records and twelve years later "Undercover Of The Night proved that they could come up with new tricks.